Non-seasonal, but still lovely, packaging. 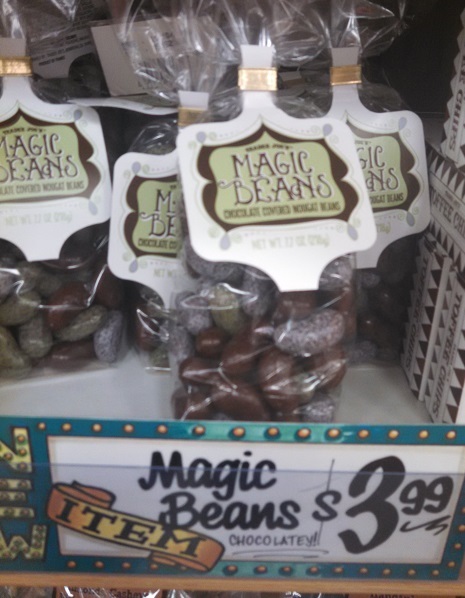 Nice work, TJ’s! Trader Joe’s has never been afraid to “go there” – in terms of yogurt development and placement. Like most grocery stores they offer a virtual cornucopia of yogurt flavors, types, and fat content. Unlike most grocery stores, they’ve been known to put out holiday versions of their classic greek yogurt. What it is: Greek yogurt in two new flavors. Worth it: Not really. Both new flavors are only mildly interesting. Last year we saw the debut of their Pumpkin Greek Yogurt over the October Pumpkin Madness. It must have worked well, because this year Trader Joe’s has debuted two new flavors for the winter holidays – Maple Brown Sugar, and Chocolate Mousse. Those might not be the flavors that come to mind when you first think “Christmas”, but that’s why we love Trader Joe’s isn’t it? They zig when everyone else is zagging. Unlike the pumpkin Greek yogurt last of last fall, these two new flavors are whole milk, full fat yogurts. 320 calories wait for you in each 8 oz tub, 12 grams of fat (7 grams of that saturated fat) and 37 grams of carbs. 3 gallons of milk go into 1 gallon of Greek yogurt, so this is the nutritional density you’re paying for – not to mention the whopping 16 grams of protein. If you eat both of these, you’ve basically had a pretty heft meal. So, are these novel yogurt flavors worth it? What you certainly can expect is what you always get from a whole milk Greek yogurt – thick, smooth, velvety and thick again. A greek yogurt needs to be eaten slowly, regardless whether you enjoy the flavor or not. The flavors, in this case, are intriguing, but not incredible. The Maple Brown Sugar Greek Yogurt has a wonderfully evocative name, but doesn’t taste particularly special. It’s a combination of real brown sugar and real maple syrup (naturally, this being Trader Joe’s). Sugar and syrup, however, even brown sugar and maple syrup, are just your basic sweeteners. Basic sweetness is about what you get out of them here. The more nuanced notes of the sugar and syrup are lost in the generally yogurtiness of the yogurt. However, the sweetness is a nice counterpoint to the considerable tang of the yogurt cultures. Overall, a nice, fatty yogurt. The Chocolate Mousse Greek Yogurt is a more complex matter. Some time ago, I reviewed Trader Joe’s European-style chocolate yogurts, and found them intriguing and sophisticated, but ultimately a bit off-putting. This chocolate greek yogurt is a lot thicker than those little yogurt pots, but hte flavor is the same – tangy chocolate. If you can hold those two words together in your head at the same time and not shudder a little, then you will probably enjoy this yogurt. The chocolate flavor comes courtesy of cocoa powder touched up with some sugar and vanilla extract, and it’s done well. The chocolate is strong tasting, bold and verging on the bitterness of dark chocolate, but it comes paired with the strong, undeniable tang of active yogurt cultures. Tangy chocolate folks – it’s here again. I love novelty, and for some reason I really love novel yogurt flavors, but these two yogurts left me underwhelmed. The Maple Brown Sugar was too generically sweet for me to buy again, and if I wanted to try chocolate yogurt again I’d go with the European versions that are still on the shelves. I’m tempted to recommend these as a desert surrogate, but honestly if you have room in your dietary budget for 300 calories of sugar and fat, just eat a real chocolate mousse. Aside from that, I think only Greek yogurt fans in desperate need of a little variety can really justify making this purchase. Would I Recommend Them: Only in the faintest of terms. Would I Buy Them Again: Me? No. Final Synopsis: Fatty yogurt available in a couple mildly interesting flavors. The pumpkin? Sure. The cinnamon and nutmeg? Problematic. 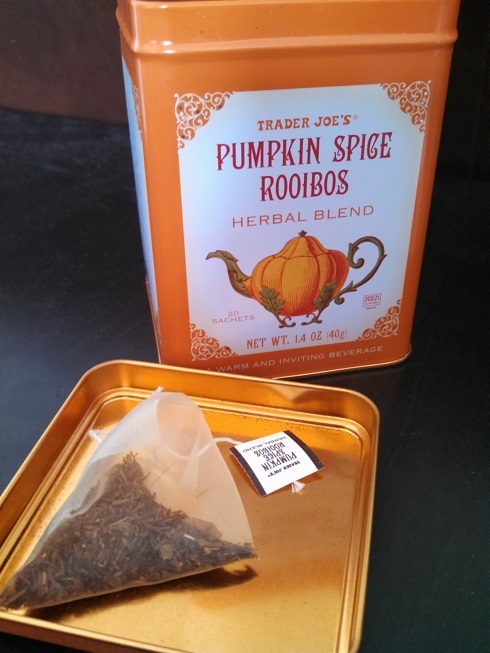 Every year I tell myself, “Trader Joe’s couldn’t possibly have more unusual pumpkin products than they had last year”, and every year I’m proven wrong. 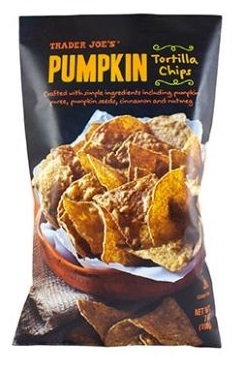 This October, it’s Trader Joe’s Pumpkin Tortilla Chips that literally stopped me in my tracks. Yes, corn tortilla chips made with pumpkin. Like pumpkin panettone and pumpkin yogurt before them, no one was asking for this – but Trader Joe’s was going to damn well make it. What it is: Cinnamon-spiced, pumpkin & corn tortilla chips. Price: $3.99 for a 12 oz. bag. Worth it: No – the flavors don’t really work out. Pumpkin tortilla chips are, basically, just your ordinary, run-of the-mill yellow corn tortilla chips – only with pumpkin puree and pumpkin seeds mixed in. Not content to stop there, Trader Joe’s then dusted each chip with a sprinkling of cinnamon and nutmeg. Although no added-sugar goes into them, the tortilla chips are kind of vaguely sweet, tasting almost slightly of churros, but with a vague pumpkin aftertaste. The pumpkin I can understand – as a mild member of the squash family it can work pretty well along side corn. Cinnamon and nutmeg, on the other hand, are very noticeable flavors. They don’t always play well with others. In particular, I’m thinking of chips and salsa, and nachos, the most common applications of the tortilla chip. Would you be likely to add cinnamon and nutmeg to your melted cheese or salsa dip? Probably not. 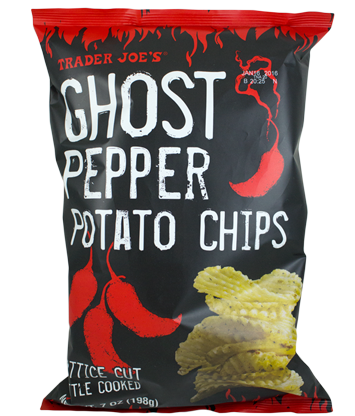 In fact, I decided to give these chips the benefit of the doubt and try them with Trader Joe’s pumpkin-based Harvest Salsa. Even in this case, even with a harmonious pumpkin taste in the salsa, the cinnamon and nutmeg threw off the whole flavor balance. The sweetness and spices clash with everything else. This not-quite-right combination of spices reminds me a lot of what Trader Joe’s just tried with their Pumpkin-Spiced Salted Caramels. In that case, the strange combination of flavors was intriguing enough to push me into “like” territory. I can’t say the same thing for these pumpkin tortilla chips, which are a their heart still just ordinary chips. Nothing special about these, just something “off”. If you wanted to use them with anything, you would need to brainstorm some pretty out-of-the-box ideas. For example, they might go well at a party with a sweet caramel or frosting dip – maybe kind of cinnamon dessert dip? The chips may even work well with highly seasoned Middle Eastern or Greek dips, such as Trader Joe’s Muhammara or cool Tzatziki. That is some amazing, over-heated copy – combining multiple puns with a lengthy bit of alliteration. The TJ’s copy writer was definitely firing on all cylinders that day. My question is, why would you want to waste such effusive praise on such a merely average product? This is a classic, one-season-and-done novelty if I ever saw one. That product description could work on literally any pumpkin product – why not save some of the puns for the big ones – like Trader Joe’s Pumpkin Pie Spice Cookie Butter, for instance. I don’t know, it just strikes me as a waste of a well-turned phrase here. Really, Trader Joe’s Pumpkin Tortilla Chips are a great example of “Yes, we can do it, but should we?” Yes, you can sell everything, quit your job, and become a tugboat captain, or gain hundreds of pounds in a bid to be the World’s Fattest Man, but should you? 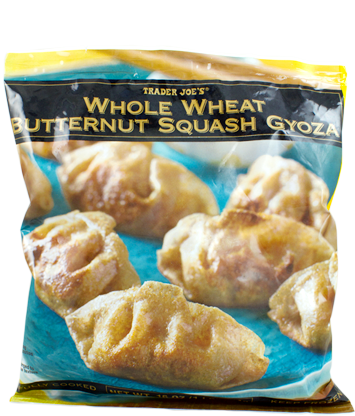 In this case, Trader Joe’s clearly has the power to put pumpkin into any product they wish, but there are some products that don’t really benefit from it. Would I Recommend It: No – unless you had the perfect dip in mind. Would I Buy It Again: I don’t see a need for that. Final Synopsis: Cinnamon and nutmeg corn tortilla chips are novel, but not novel enough. I am a dyed-in-the-wool, straight-up chips and salsa fiend. Give me some chips, give me some salsa, and everything is just fine as far as I’m concerned. I have yet to find a jar of salsa that is big enough that I won’t finish it off in a single sitting. What it is: Bland tasting, baked tortilla chips. Price: $1.99 for a 7 oz. bag. Worth it: No, they taste stale. Unfortunately, I’m getting fat. And while salsa is a good, healthy, vegetable-based, low-cal snack – tortilla chips, with all their carbs and fat, definitely are not. It’s a sad state of affairs, but I now live a chips and salsa free life. There are many types of delicious (and not so delicious) salsas available at Trader Joe’s, and just as many unusual chip choices – often featuring healthful gimmicks (such as flax seeds). 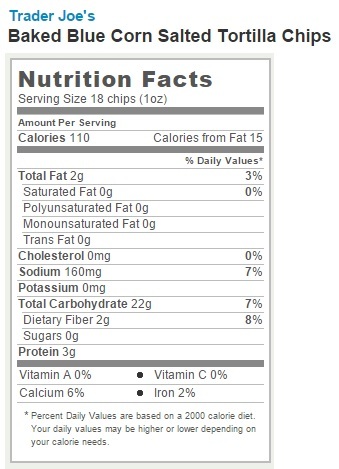 However, even “healthy” tortilla chips usually have more fat and carbs than I’d like to gorge myself on. So I was delighted when I came across Trader Joe’s Baked Blue Corn Tortilla Chips the other day. Promising only 2 grams of fat per serving, they were the healthiest chips I have ever come across. Taking them home, I gleefully rejoiced in finding the answer to my prayers. Unfortunately, they taste like crap. Or, more correctly, they taste like bland tortilla chips that have gone stale straight out of the bag. Another review of these chips likens them to “cardboard”, and that’s not far off. The sad fact is that Trader Joe’s Baked Blue Corn Tortilla Chips are flat and lifeless. Even salted, these chips simply fail to delight the tongue. Not being fried, these chips lack the crispiness, crunch and snap of a traditional tortilla chip. If, before I ever tried them, you’d asked me if I would trade such seemingly inconsequential concerns of texture for less fat, I would have said yes. And I would have been wrong. It doesn’t seem like something as run-of-the-mill as “crunchiness” should make or break a tortilla chip – but in this case it absolutely does. If you’ve ever tried a tortilla chip from a bag that’s been left open a few days too long, you know exactly how these taste. There’s simply no saving a stale tortilla chip – no matter how flavorful the salsa or how delicious the nacho cheese. It’s sad, but a stale tortilla chip is little more than garbage. 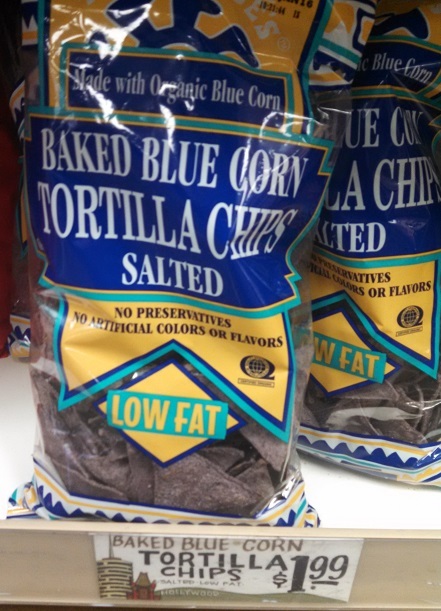 No matter how I tried to appreciate the healthy elements of these blue corn chips, I simply couldn’t get over the stale taste. Maybe you’ll have better luck at that than I did, but as far as I’m concerned my quest for a healthy – and tasty – tortilla chip continues. Would I Recommend Them: Nope – too stale tasting. Would I Buy Them Again: Not unless I’m reaaaaally desperate for a chip fix. Final Synopsis: Unless they actually made you thinner, these chips ain’t worth it.